New focus group on “Developing your Core Strength.” Watch for information about how to sign up in early January. I was scheduled to fly from Philadelphia to Pittsburg this week to do a television show. On a good day it takes me about 80 minutes to drive to the Philadelphia airport from my house. Snow flurries were forecast for Tuesday but they weren’t supposed to last. But they did and got heavier and heavier as the morning wore on. I began to worry. I have a disease my children have dubbed, “Worst Case Scenario Disease.” Perhaps you have it too. My mind began imagining the worst things that might happen while I was driving to the airport in the snow. For example, I might miss my plane or it would be cancelled and I wouldn’t be able to get to the television show. Or, I might get in a terrible accident and never make my plane. Or, the plane would crash because the wings got icy. Crazy, I know, but I’m just being real. But the good news is, I have learned how to get myself out of such emotional quicksand and I want to teach you how too. It’s called the prayer of surrender. We all have many desires – good and legitimate desires, nothing God would disapprove of. But what starts to happen to us when our desires get delayed, frustrated or denied? My desire in that moment was to get to the airport, make my plane and fulfill my responsibilities to be on that television show. Perhaps your desire is to have a stress free Christmas, a nice family dinner, a spouse that loves you, children who obey you, and a paycheck that supports your financial obligations. There is nothing wrong with your desires. But when our desires start to become demands our anxious, angry, or discouraged countenance tells us we’re slipping into dangerous territory. In those moments we don’t believe God is enough. We want (demand) more than he’s provided. We’re bowing down to an idol (what we MUST have) that is now RULING us instead of Christ. Typically human desires cluster around three main themes. Power and control, affirmation, approval, & appreciation, and security and comfort. Once we recognize that our legitimate desires have grown into idols, we have a choice −to cling to what we want or to trust God and surrender. Lord, I want to get to the airport on time and meet my obligations. I’m aware that my body is tense and my heart is gripped with worry (anger, hurt, or whatever emotion you are experiencing in the moment) that I’m not going to get what I want. Right now I surrender my desire for control over this situation. I cannot control the weather, how fast the traffic moves, or whether or not I get to the airport or the plane is cancelled. I surrender my desire for power over these things to you. I surrender my desire for affirmation and approval. I want to keep all my obligations and meet my responsibilities. I want people to like me and approve of my work. I let go of my desire for these things. I choose to trust you for my value and worth. I surrender my desire for security and comfort. I don’t know what will happen during this snowstorm but I trust you love me and are in control. Let us learn from Mary, the mother of God, who surrendered her desire for control when she said to the angel, how can this be? She surrendered her desire for affirmation and approval when she let go of what Joseph and her mother and father would think of her when they found out she was pregnant. And she surrendered her desire for security and comfort when she trusted God with her life, her body, her future, and her family. My gift to you is this prayer. My challenge to you is that you practice it, particularly during this busy season. Let go of the demand to have power and control, approval, appreciation and affirmation and security and comfort. Then notice what happens. The peace of God that surpasses all understanding will come to guard your heart and mind in Christ. I hope you all have a wonderful holiday. God Bless. Some of you are waking up to the idea that its okay for you to have personal boundaries and to implement consequences if someone chooses to disrespect them. Today I want to summarize this whole idea of boundaries and consequences why they are so important to healthy living and healthy relationships. What is a boundary? Think of a fence around your house, with a gate or two that you can open or close or lock if you need to. This fence creates awareness of where something begins and ends. It helps my neighbor and me know what house I need to clean and what house he or she needs to clean, what lawn I need to mow and what lawn he needs to mow. In a pinch we may help each other out, but our property lines are clear. If my neighbor just walked into my house and helped himself to whatever he wanted, whenever he wanted and that bothered me but I never said anything, I would be guilty of not having good boundaries. Personal boundaries help us clarify things, such as what we are responsible for and what are not responsible for. If my neighbor disrespected my feelings or my fence and walked into my house, I may have to set a firmer boundary such as putting a lock on my gate or a deadbolt on my door. 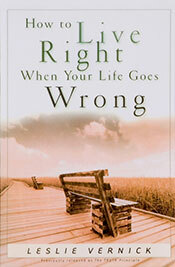 How to Live Right When Your Life Goes Wrong by Leslie Vernick. Plus see the winner of the previous give away! Description: Despite the abundant availability of both self-help books and Bible study materials, many of us find it difficult to apply what we learn, to make that long head-to-heart journey of change. When we are faced with life’s daily trials, our responses often lack the Christian maturity we desire – showing us clearly just how far we have to go. Is it possible to achieve a deeper, more permanent change of heart? Author and counselor Leslie Vernick says yes. Come on a journey of personal growth and spiritual discovery as your heart is drawn back to a central tenet of the Gospel: Truth isn’t something you learn, but Someone you know. And the Truth will set you free. To win this book, please email your name to assistant@leslievernick.com with "Book Give Away" in the subject line by midnight Sunday, January 5th. The winners of The Emotionally Destructive Relationship by Leslie Vernick are: Georgianna M (Yuma, AZ) and Linda S.
"Her (Leslie) material was biblical, relevant, interesting and easy to follow. She was very transparent, personable, sincere and had a good sense of humor. Leslie always followed the time constraints of our schedule and availed herself to the ladies for personal conversation and counseling during free time. The women were very appreciative of our choice of speaker. I, personally, was blessed by her humble manner and the way in which she ministered to the ladies."